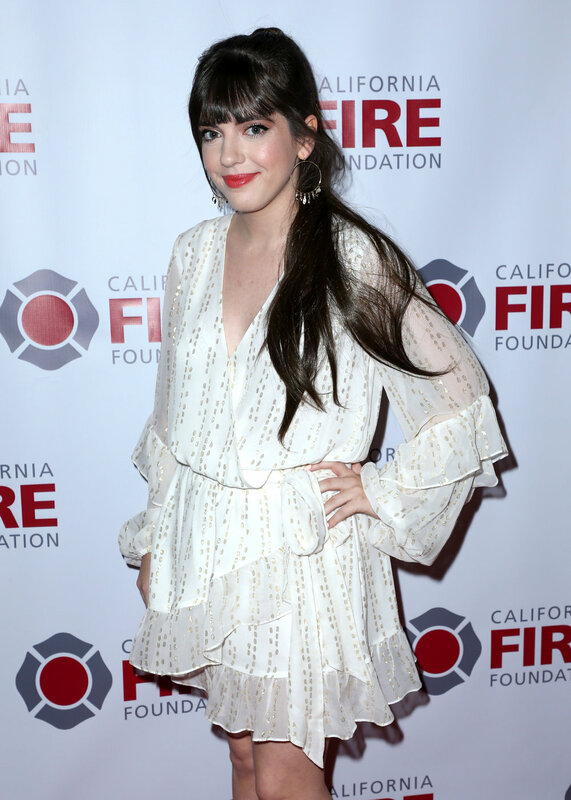 Deets: The California Fire Foundation (CFF), a non-profit 501 (c)(3) organization, hosted its 6th Annual Celebrating Uncommon Courage Gala at the Avalon Hollywood this evening. The gala raises crucial funds to support CFF’s mission to provide emotional and financial assistance to families of fallen firefighters, firefighters, and the communities they protect. The Foundation presented a special award to Molina Healthcare for its signature show of support during the catastrophic 2018 fires. Del Bell, Senior Vice President of Operations, accepted the award on behalf of Molina Healthcare. Also recognized for their efforts supporting the 2018 fire victims was renowned artist Tim Collom, who raised over $100K by selling his signed prints following the fires and Josh and Simone Baker, who helped coordinate the distribution of the more $2 million in relief that was given out by the Foundation’s SAVE (Supplying Aid to Victims of Emergency) program. Attendees mingled with firefighters and celebrities, enjoying live music from American folk rock band, Dawes, which features two members from the heavily impacted area of Malibu, and stand-up comedy from host Jackie Tohn and auctioneer Michelle Westford. Special edition works of art from Tim Collom and renowned artist Riskwere also on display. CFF Chair Brian Rice opened the evening with a special thanks to Mayor Eric Garcettiwho, along with actor/activist Alyssa Milano, raised significant funds in response to the 2018 wildfires, resulting in the establishment of CFF’s Benevolent Fund, a program intended to provide assistance and support to firefighters displaced or impacted by fire or natural disasters. Rice announced that the Foundation’s SAVE Program (Supplying Aid to Victims of Emergency) will permanently increase the immediate direct assistance it provides to families who suffer catastrophic losses in fire or disaster -- from $100 to $250. CFF honored Molina Healthcare for the company’s ongoing support of the Foundation’s programs, especially during the 2018 wildfires. To a standing ovation, CFF honored Tim Collom for his support of both the Foundation’s through the donation of profits made from the selling of over 3000 signed prints he created in response to the fires. CFF honored Josh and Simone Baker with the 2019 Outstanding Service Award in appreciation of their devotion, commitment, and dedicated service to the distribution of the SAVE cards to those who suffered catastrophic losses in last year’s wildfires. The event Host Committee includes Dusty Baker, Ed Begley Jr., Rachelle Carson-Begley, Bruce Bochy, Alex Burke, Jaime Camil, Aaron Cooley, David Dickerson, Tim Dowling, Dwight Hicks, Dawn Holiday, Scott Karol, Leandra McPartlan-Karol, Jason Kramer, Tony La Russa, Jodi Lieberman, Robin Lippin, Mela Lee, Bryan “Birdman” Mier, Charles Papert, and Thinkspace Gallery. Major event sponsors include, in part, Black Stallion Estate Winery, Martini & Rossi Cuervo Tradicional, Grey Goose, Aberfeldy, Bacardi, Bombay Sapphire, Three Weavers Brewing Company, Tequila Cazadores, The Coffee Bean and Tea Leaf, St. Germain, Sconely, Raindrop Cookies, and Planet Salon. California Firefighters Memorial: The Foundation designed, built and maintains this unique memorial to fallen firefighters at the State Capitol in Sacramento. Community Improvement: The Foundation supplies public safety resources and conducts outreach and education about fire safety issues through its Firefighters On Your Side program. Hint For The Average Socialite: Tickets and sponsorships were available here. You can also donate here, to support California Fire Foundation.